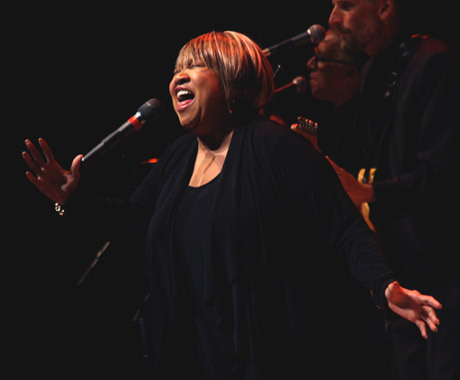 Two songs into her set, just before launching into a lively cover of Talking Heads' "Slippery People," Mavis Staples paused to roll up her sleeves. It wasn't the first time, or the last, that the soul icon took on a fighter's pose at last night's show. While some aging performers exude quiet confidence onstage, I've found the most entertaining ones feel like they're in the midst of a 10-round main event, still keen to go blow-for-blow with the best of them. "I'm still fighting! I'm a soldier!" Staples shouted after a crowd-rousing take on the night's oldest song, "Freedom's Highway," which the Staple Singers first recorded in 1965. Last night's show, presented by the Halifax Jazz Festival, was one of Staples' only performances in Canada this year and her first in Halifax since a gig with the Nova Scotia Mass Choir back in 1997. "We were wondering, 'Why hasn't Halifax called us?'" Staples asked with a gleeful chuckle. Staples' enthusiasm is infectious, but it's her voice that forms the strongest connection with the crowd. Filled with grit and grain, it doesn't so much leap effortlessly to each note as it, instead, rips and burns its path, leaving the audience cheering for more of its glorious, scorched-earth power. Staples' set relied mostly on inspired covers — including Lauryn Hill's "Everything is Everything" and Funkadelic's "Can You Get To That" — along with Staple Singers classics like "Let's Do It Again" and "I'll Take You There." There was no short-changing the crowd on account of the performer's age: the crowd got a full night's show, including an encore with the freedom song "Ain't Gonna Let Nobody Turn Me Around." Staples did take a stool to sing the title track from her 2013 Jeff Tweedy-produced album, One True Vine, and also took a breather for a late-set instrumental jam by her three-piece band. But, in both cases, her enthusiasm couldn't be contained: she just had to stand up to hit the climatic note of "One True Vine," and spent the entire instrumental break cheering on the musicians from her stool in the wings of the stage. Staples is 75, and last night's large turnout suggested many might have felt it was their last chance to see the legend in person; it's unlikely Halifax can wait another 17 years between shows. But there was no pretence of farewell: in fact, Staples insisted several times that she'd return, if we'd have her, promising to put something together with local crooner Erin Costello (whose short-but-sweet set opened the show). At one point, when the crowd started yelling out requests, Staples answered: "Keep those for next time; we'll be back."